You can place on your home screen only the apps that you really enjoy avoiding any confusing cluttering. You’ll have a pure, simple interface. 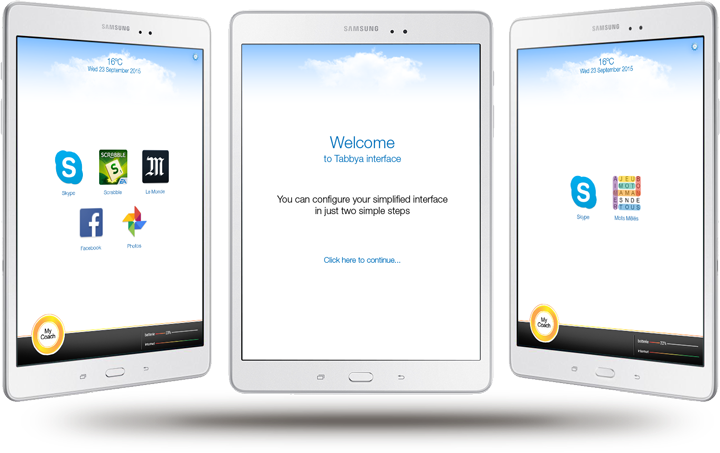 If you want a One-button interface, with Tabbya you can have it. If you, your kids or your buddies are less tech-savvy, you can really benefit from this minimalist design. Tabbya Interface adds some nice extra feature, like creating theme folders (games/news/media/health/tools/communication), running a digital photo frame mode (your device displays pictures of you choice when not in use), or limit access to Tabbya settings via PIN code. 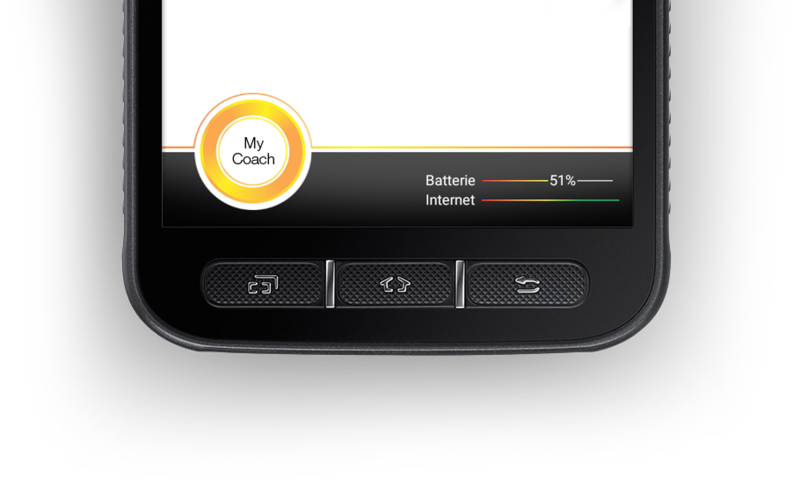 «My Coach» Press the orange help button and receive real time remote support from a member of our team. If necessary you can share you screen with us and we’ll show you how to find apps, use apps, or fix things on your phone or tablet. «Super Device Manager» Make your home screen a «safe zone» by preventing the display of the notification bar. This bar gives direct access to WiFi and other more advanced settings. My Coach can be used with Tabbya interface or separately. Register and receive a 10 min time-credit of support from our team. We are professional coaches who know that listening and understanding what you want to achieve is half of the way to succeeding in helping you. Android and Samsung devices have no secrets to us and rest assured you’ll find the right answer if you contact us. You never know when an emergency occurs, but when it happens, it’s great to be able to send your GPS location. That’s exactly what Emergency Call is doing. Your alarm can reach someone from your family or a dedicated 24/7 emergency helpline. It’s a freemium app. You can try the free version – 1 SMS containing you geolocation will be sent to a contact of your choice. Once you’ve tested, feel free to upgrade to the premium version – up to 9 SMS messages will be sent to 9 of your contacts, one after the other, until one of them calls you back. You’re phone will auto pickup calls on speaker. To benefit from a state-of-the-art quality of service, you can activate a subscription to a 24/7 emergency helpline service. 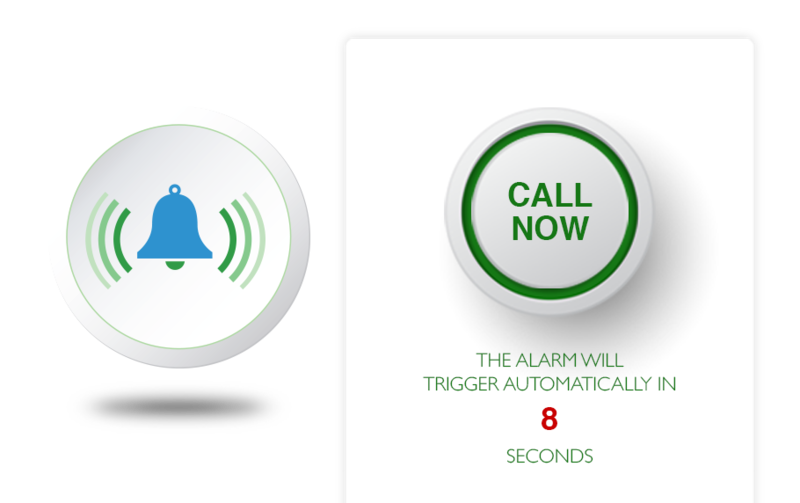 A highly professional team trained to analyse and react to emergency situations will take your call or react to an automatic alarm message sent by the app.